Service-learning basics and different program approaches for different age-groups. Youth involvement, commitment in your organization, and partnerships. Steps for each program stage: preparation, action, reflection, and recognition. 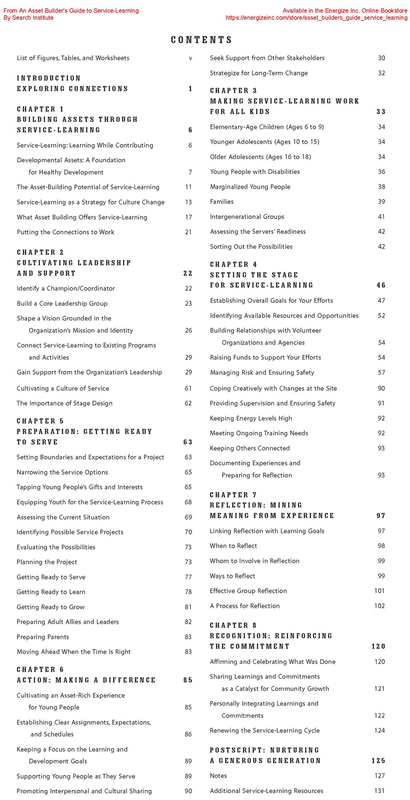 Stories and examples from service-learning programs around the country. Recognizing the important role that adult sponsors and allies play in service-learning experiences and emphasizing the need for adequate adult involvement and supervision in service-learning efforts. Both of these approaches are important strategies for building intergenerational relationships through service-learning. In addition, organizations and communities are recognizing the potential of people of all ages—from young to middle-aged to elderly—serving others together. And while such an approach may be difficult to undertake in settings that primarily serve one age group (such as schools), the potential is great in organizations that engage people of all ages, including community initiatives, community agencies, volunteer centers, and congregations. Be explicit and intentional in nurturing mutual respect and understanding across generations. This can be accomplished, for example, by ensuring that people from all generations have active leadership roles in planning and executing projects. It also can be addressed by ensuring that no single generation dominates times of reflection. Developing intergenerational programs doesn’t have to begin from scratch. Often, existing service-learning activities can be broadened to include other generations. If, for example, you already have a strong youth service-learning program, look for ways to incorporate other ages into those experiences to make them more intergenerational. Or identify specific components of existing programs that would naturally work as intergenerational experiences. Young people can often be the catalysts for involvement by other ages. As young people have positive service-learning experiences on their own, others see their enthusiasm and can be eager to join in if invited. In these cases, the young people become the teachers and mentors to others who get involved.